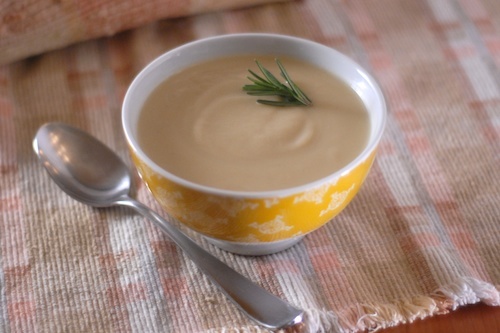 This butternut squash soup is a little sweet from the pears, a little savory from the onions, herbs, and stock, just the thing on a nippy fall day. This is how I make it for an everyday soup recipe. 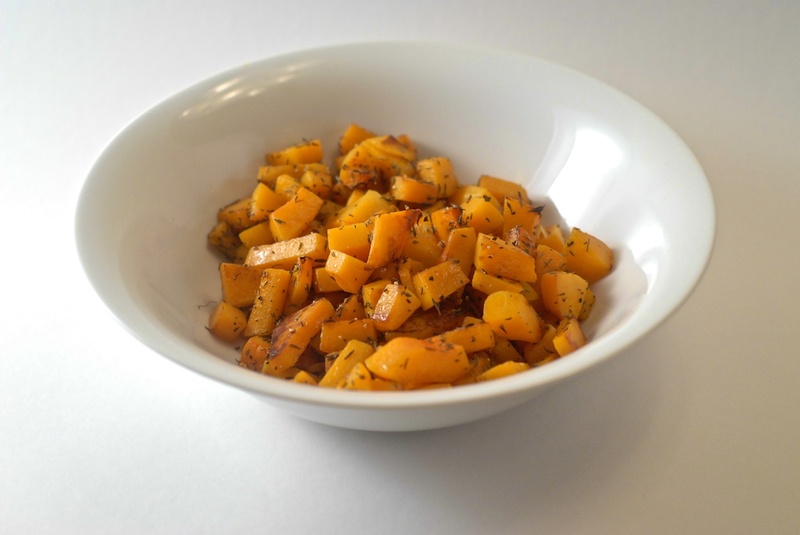 If you have more time and want to intensify the flavor, roast the squash in the oven at 350 instead of microwaving it. Cubing the squash before roasting it will be the most labor intensive way but also the best, see my directions for cutting butternut squash safely here. Cooking the squash whole is easier and how I usually do it, assuming I’ve taken that small step above microwaving. You can substitute apples for the pears: choose a flavorful variety like Jonagold or Pink Lady. 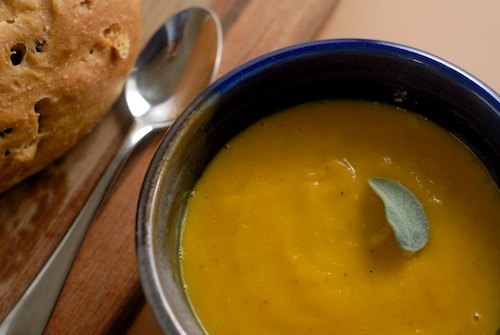 Butternut squash soup with added sweetness from pears and savoriness from sage, onion, and oregano. 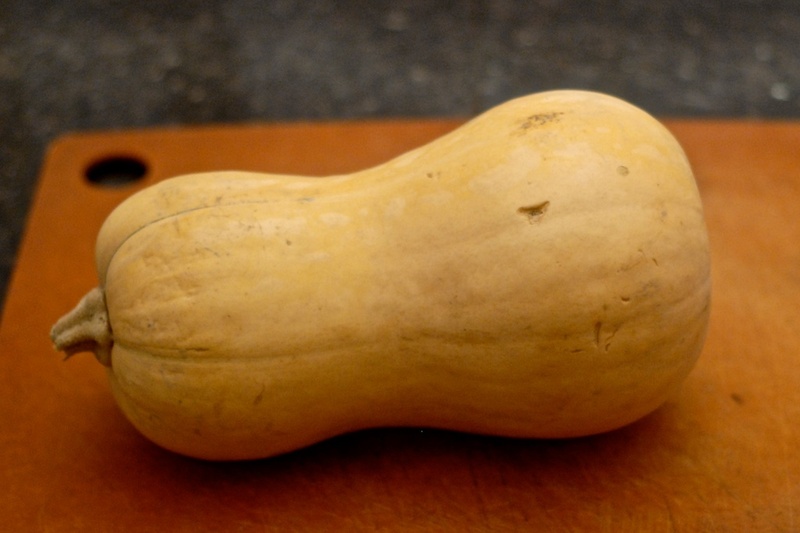 Microwave the butternut squash for a few minutes until it is soft enough to cut easily. Meanwhile chop an onion and sautee it in olive oil in a large pot. When squash is done, cut in half, remove seeds, chop roughly. You can leave the skin on. Quarter two pears, remove seeds. Add pears, squash, spices, water and stock (if using stock) to the onions. Simmer until squash and pear are fully cooked, about 20 minutes. Blend in a large blender like a Vitamix or a food processor– be careful when you are blending hot liquid, don’t fill your blender too full or put it on too high a speed at first. Add salt, pepper, and herbs to taste. Cubed Butternut Squash with Thyme Cubed butternut squash cooked in water or cider, dressed with olive oil, sprinkled with thyme, salt, and pepper. Simple, well-received. The thyme adds depth to the flavor. Cutting Butternut Squash Safely Here's the safest way to cut a butternut squash, with step-by-step directions and photos.